I pulled out my back and am having some trouble sitting at the computer right now, I spent yesterday lying on ice packs on the floor and watching Glee. That might have been fun if I didn’t have so much darn wedding stuff to do. My great-grandmother always said “man plans, god laughs” of course she said it in Yiddish, but it’s the idea of it that matters. Recently, while eating dinner with parents one night and discussing what the hell I’m going to do with my life. I casually joked “My goal is to be the next Lisa Frank”, chuckling to myself, I soon realized they were staring at me blankly. Well, apparently the magical wonder of Lisa Frank somehow flew over the heads of my parents generation. Maybe they chose to block out the rainbow horses and angel kitties, or write them off as teeny-bopper stuff, which is easy to do. 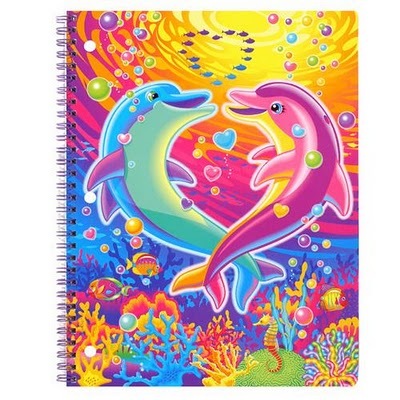 I however still get a rush of excitement when I see Lisa Frank products, I mean come on, look at this, that’s just fun. I still get just as happy seeing this now as I did at my 3rd grade book fair when I bought a Lisa Frank folder and a poster of a dolphin jumping through intergalactic oceans (sorry mom, I guess I should have used that money to buy books). I don’t think any of my professors in art school would have appreciated me citing her as an inspiration though. But then again, they didn’t particularly appreciate anything that was overtly feminine, or so I felt, but more on that another time. I have a preference for the animals over her new line of “girls” which look a lot like Bratz dolls, am I right? I don’t find them nearly as interesting or appealing as her older characters. There was (is) something so sweet and fun about rainbow animals with wings, flying around being cute, but also cool, at least for the 9-year-old me it was. My point is that this is illustration, and it was nice to see this woman who obviously built an empire based on work she loved doing. Now we have licensed characters from shows and movies, and sanrio and Disney Princesses will always be around, but I miss Lisa Frank. I haven’t really seen anyone else like her around, not in as big a way as she was. Whether you like her stuff or think it is saccharine and seizure inducing, you have to admit that she created her own world, did what she liked, and was really successful at it. Wikipedia calls her a “pop artist”, which seems an appropriate title, they also say you can see her headquarters from a plane because it’s decorated with rainbows, stars, and hearts, how amazing is that? I’m happy with it, I think it really encapsulates my own teen years. From Manic Panic to baby hair clips. Lisa Frank hot air Balloon! What?